Disperser with Multi Station Vessel is suitable for mixing, dissolving and dispersion of medium to high viscous millbase at large scale. The millbase of viscosity up to 1,000,000 cP can be handled by our HSD. Our dispersers are supplied with inTorq drive or frequency inverter. Our dispersers can guarantee short batch cycles. The inTorq drive enables the intelligent watchfulness of the torque management function. It distributes the torque to the dispersion tool according to the dynamic changes in the viscosity of the millbase. Our standard dispersers are of floor mounted type. We can also install the standard equipment as mezzanine mounted dispersers with fixed process containers and swivelling dispersion head for larger batch sizes. 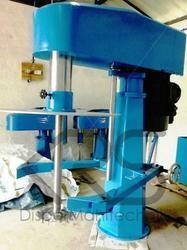 High Shear Disperser is suitable for mixing, dissolving and dispersion of medium to high viscous millbase. The millbase of viscosity up to 1,000,000 cP can be handled by our HSD. Our dispersers are supplied with inTorq drive or frequency inverter. Our dispersers can guarantee short batch cycles. The inTorq drive enables the intelligent watchfulness of the torque management function. It distributes the torque to the dispersion tool according to the dynamic changes in the viscosity of the millbase. Our standard dispersers are of floor mounted type. We can also install the standard equipment as mezzanine mounted dispersers with fixed process containers and swivelling dispersion head for larger batch sizes. 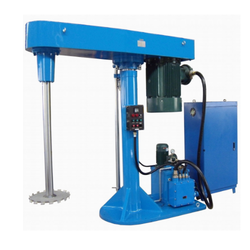 High Speed Disperser is suitable for mixing, dissolving and dispersion of medium to high viscous millbase. The millbase of viscosity up to 1,000,000 cP can be handled by our HSD. Our dispersers are supplied with inTorq drive or frequency inverter. Our dispersers can guarantee short batch cycles. The inTorq drive enables the intelligent watchfulness of the torque management function. It distributes the torque to the dispersion tool according to the dynamic changes in the viscosity of the millbase. Our standard dispersers are of floor mounted type. We can also install the standard equipment as mezzanine mounted dispersers with fixed process containers and swivelling dispersion head for larger batch sizes. 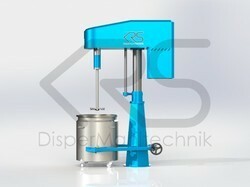 Laboratory Disperser is suitable for mixing, dissolving and dispersion of medium to high viscous millbase. The millbase of viscosity up to 1,000,000 cP can be handled by our HSD. Our dispersers are supplied with inTorq drive or frequency inverter. Our dispersers can guarantee short batch cycles. The inTorq drive enables the intelligent watchfulness of the torque management function. It distributes the torque to the dispersion tool according to the dynamic changes in the viscosity of the millbase. Our standard dispersers are of floor mounted type. We can also install the standard equipment as mezzanine mounted dispersers with fixed process containers and swivelling dispersion head for larger batch sizes. Twin Shaft Disperser is suitable for mixing, dissolving and dispersion of medium to high viscous millbase. The millbase of viscosity up to 1,000,000 cP can be handled by our HSD. Our dispersers are supplied with inTorq drive or frequency inverter. Our dispersers can guarantee short batch cycles. The inTorq drive enables the intelligent watchfulness of the torque management function. It distributes the torque to the dispersion tool according to the dynamic changes in the viscosity of the millbase. Our standard dispersers are of floor mounted type. We can also install the standard equipment as mezzanine mounted dispersers with fixed process containers and swivelling dispersion head for larger batch sizes. 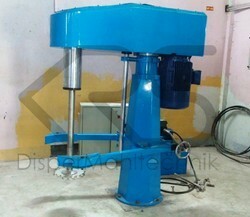 Multi Shaft High Shear Disperser is suitable for mixing, dissolving and dispersion of medium to high viscous millbase. The millbase of viscosity up to 1,000,000 cP can be handled by our HSD. Our dispersers are supplied with inTorq drive or frequency inverter. Our dispersers can guarantee short batch cycles. The inTorq drive enables the intelligent watchfulness of the torque management function. It distributes the torque to the dispersion tool according to the dynamic changes in the viscosity of the millbase. Our standard dispersers are of floor mounted type. We can also install the standard equipment as mezzanine mounted dispersers with fixed process containers and swivelling dispersion head for larger batch sizes. Mezzanine Mounted High Shear Disperser is suitable for mixing, dissolving and dispersion of medium to high viscous millbase. The millbase of viscosity up to 1,000,000 cP can be handled by our HSD. Our dispersers are supplied with inTorq drive or frequency inverter. Our dispersers can guarantee short batch cycles. The inTorq drive enables the intelligent watchfulness of the torque management function. It distributes the torque to the dispersion tool according to the dynamic changes in the viscosity of the millbase. Our standard dispersers are of floor mounted type. We can also install the standard equipment as mezzanine mounted dispersers with fixed process containers and swivelling dispersion head for larger batch sizes. 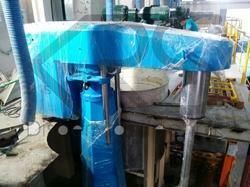 Varibale Speed Disperser is suitable for mixing, dissolving and dispersion of medium to high viscous millbase. The millbase of viscosity up to 1,000,000 cP can be handled by our HSD. Our dispersers are supplied with inTorq drive or frequency inverter. Our dispersers can guarantee short batch cycles. The inTorq drive enables the intelligent watchfulness of the torque management function. It distributes the torque to the dispersion tool according to the dynamic changes in the viscosity of the millbase. Our standard dispersers are of floor mounted type. We can also install the standard equipment as mezzanine mounted dispersers with fixed process containers and swivelling dispersion head for larger batch sizes. Variable Shear Disperser is suitable for mixing, dissolving and dispersion of medium to high viscous millbase. The millbase of viscosity up to 1,000,000 cP can be handled by our HSD. Our dispersers are supplied with inTorq drive or frequency inverter. Our dispersers can guarantee short batch cycles. The inTorq drive enables the intelligent watchfulness of the torque management function. It distributes the torque to the dispersion tool according to the dynamic changes in the viscosity of the millbase. Our standard dispersers are of floor mounted type. We can also install the standard equipment as mezzanine mounted dispersers with fixed process containers and swivelling dispersion head for larger batch sizes. Automotive Paint Disperser is suitable for mixing, dissolving and dispersion of medium to high viscous automotive paint millbase. The millbase of viscosity up to 1,000,000 cP can be handled by our HSD. Our dispersers are supplied with inTorq drive or frequency inverter. Our dispersers can guarantee short batch cycles. The inTorq drive enables the intelligent watchfulness of the torque management function. It distributes the torque to the dispersion tool according to the dynamic changes in the viscosity of the millbase. Our standard dispersers are of floor mounted type. We can also install the standard equipment as mezzanine mounted dispersers with fixed process containers and swivelling dispersion head for larger batch sizes. Decorative Paint High Shear Disperser is suitable for mixing, dissolving and dispersion of medium to high viscous decorative paint millbase. The millbase of viscosity up to 1,000,000 cP can be handled by our HSD. Our dispersers are supplied with inTorq drive or frequency inverter. Our dispersers can guarantee short batch cycles. The inTorq drive enables the intelligent watchfulness of the torque management function. It distributes the torque to the dispersion tool according to the dynamic changes in the viscosity of the millbase. Our standard dispersers are of floor mounted type. We can also install the standard equipment as mezzanine mounted dispersers with fixed process containers and swivelling dispersion head for larger batch sizes. 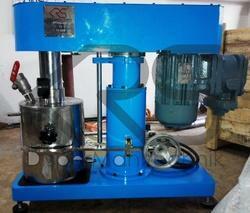 Emulsion Paint Disperser is suitable for dispersion of medium to high viscous millbase. The millbase of viscosity up to 1,000,000 cP can be handled by our HSD. Our dispersers are supplied with inTorq drive or frequency inverter. Our dispersers can guarantee short batch cycles. The inTorq drive enables the intelligent watchfulness of the torque management function. It distributes the torque to the dispersion tool according to the dynamic changes in the viscosity of the millbase. Our standard dispersers are of floor mounted type. We can also install the standard equipment as mezzanine mounted dispersers with fixed process containers and swivelling dispersion head for larger batch sizes. 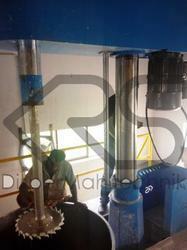 Paint Manufacturing Plant is suitable for dispersing or predispersing paints in medium to large scale production. The millbase of viscosity up to 1,000,000 cP can be handled by our HSD. Our dispersers are supplied with inTorq drive or frequency inverter. Our dispersers can guarantee short batch cycles. The inTorq drive enables the intelligent watchfulness of the torque management function. It distributes the torque to the dispersion tool according to the dynamic changes in the viscosity of the millbase. Our standard dispersers are of floor mounted type. We can also install the standard equipment as mezzanine mounted dispersers with fixed process containers and swivelling dispersion head for larger batch sizes. 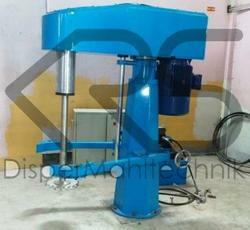 High Shear Disperser is suitable for mixing, dissolving and dispersion of medium to high viscous millbase. The millbase of viscosity up to 1,000,000 cP can be handled by our HSD. Our dispersers are supplied with inTorq drive or frequency inverter. Our dispersers can guarantee short batch cycles. The inTorq drive enables the intelligent watchfulness of the torque management function. It distributes the torque to the dispersion tool according to the dynamic changes in the viscosity of the millbase. Our standard dispersers are of floor mounted type. We can also install the standard equipment as mezzanine mounted dispersers with fixed process containers and swiveling dispersion head for larger batch sizes. Flame Proof High Shear Disperser is suitable for mixing, dissolving and dispersion of medium to high viscous solvent based millbase. The millbase of viscosity up to 1,000,000 cP can be handled by our HSD. Our dispersers are supplied with inTorq drive or frequency inverter. Our dispersers can guarantee short batch cycles. The inTorq drive enables the intelligent watchfulness of the torque management function. It distributes the torque to the dispersion tool according to the dynamic changes in the viscosity of the millbase. 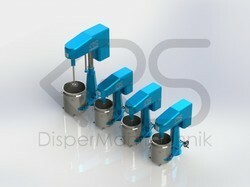 Our standard dispersers are of floor mounted type. We can also install the standard equipment as mezzanine mounted dispersers with fixed process containers and swivelling dispersion head for larger batch sizes. 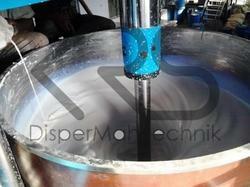 Distemper Paint Disperser is suitable for dispersing medium to high viscous millbase. The millbase of viscosity up to 1,000,000 cP can be handled by our HSD. Our dispersers are supplied with inTorq drive or frequency inverter. Our dispersers can guarantee short batch cycles. The inTorq drive enables the intelligent watchfulness of the torque management function. It distributes the torque to the dispersion tool according to the dynamic changes in the viscosity of the millbase. Our standard dispersers are of floor mounted type. We can also install the standard equipment as mezzanine mounted dispersers with fixed process containers and swivelling dispersion head for larger batch sizes. Water Base Paint Manufacturing Machine is suitable for mixing, dissolving and dispersion of medium to high viscous millbase. The millbase of viscosity up to 1,000,000 cP can be handled by our HSD. Our dispersers are supplied with inTorq drive or frequency inverter. Our dispersers can guarantee short batch cycles. The inTorq drive enables the intelligent watchfulness of the torque management function. It distributes the torque to the dispersion tool according to the dynamic changes in the viscosity of the millbase. Our standard dispersers are of floor mounted type. We can also install the standard equipment as mezzanine mounted dispersers with fixed process containers and swivelling dispersion head for larger batch sizes. Industrial Paint Manufacturing Machine is suitable for mixing, dissolving and dispersion of medium to high viscous millbase. The millbase of viscosity up to 1,000,000 cP can be handled by our HSD. Our dispersers are supplied with inTorq drive or frequency inverter. Our dispersers can guarantee short batch cycles. The inTorq drive enables the intelligent watchfulness of the torque management function. 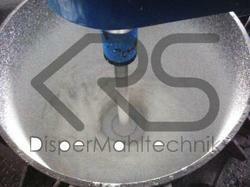 It distributes the torque to the dispersion tool according to the dynamic changes in the viscosity of the millbase. Our standard dispersers are of floor mounted type. We can also install the standard equipment as mezzanine mounted dispersers with fixed process containers and swivelling dispersion head for larger batch sizes. 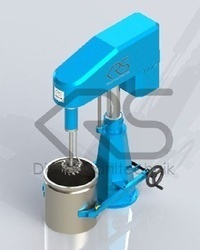 Liquid Ink High Shear Disperser is suitable for mixing, dissolving and dispersion of medium to high viscous millbase. The millbase of viscosity up to 1,000,000 cP can be handled by our HSD. Our dispersers are supplied with inTorq drive or frequency inverter. Our dispersers can guarantee short batch cycles. The inTorq drive enables the intelligent watchfulness of the torque management function. It distributes the torque to the dispersion tool according to the dynamic changes in the viscosity of the millbase. 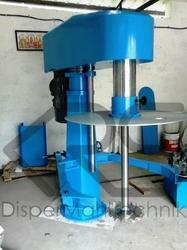 Our standard dispersers are of floor mounted type. We can also install the standard equipment as mezzanine mounted dispersers with fixed process containers and swivelling dispersion head for larger batch sizes. Looking for High Speed Dispersers ?